We have been delivering Polish bread, vegetables, fruit, cooked and cured meats, meat and juices. 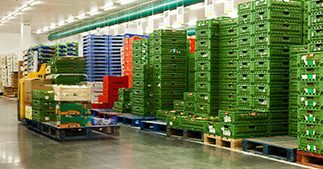 We transport flowers, frozen foods, vegetables, fruit and many other products. We maintain a fleet of Volvo and DAF trucks that are serviced regularly and exchanged for new ones every three years. The product range includes close to fifteen thousand items. It includes fresh food in the straightforward and best sense of the word. We source and deliver an exhaustive range of food products, household chemicals, stationery and many, many other items. We guarantee a flexible and smooth flow of deliveries. The product range includes close to fifteen thousand items. It includes fresh food in the straightforward and best sense of the word. We guarantee a flexible and smooth flow of deliveries. Dependability is our crowning asset. The rigs are always driven by two drivers, which means that the goods are transported swiftly and smoothly. We are open to all suggestions connected with our trading and transport services. Rofood cooperates with shop owners, retail chains and businesses that sell Polish products in EU countries. We supply the full range of products customers buy in the kinds of shops they visit every day to make their purchases. This means fresh and processed foods, vegetables, fruit, bread, dairy products, cooked and cured meats, juices, groats, oil, newspapers and magazines, and household chemicals.